Thin covering assembly system for damage-free and functionally safe floating screeds in outdoor areas with tile or stone coverings. 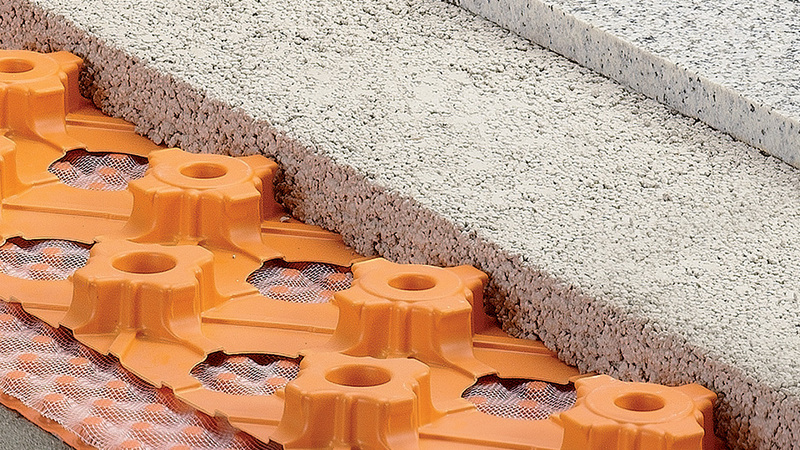 Polyethylene mat with perforated studs for reliable drainage. Installed above a waterproofing layer and below a screed or gravel layer. Polyethylene mat with cone-shaped studs. Raises the entire surface assembly, creating a continuous drainage area and avoiding capillary action. Polyethylene mat with cone-shaped studs. Raises the entire surface assembly, creating a continuous drainage area and avoiding capillary action. Particularly suitable for use with drainage screeds. Join us for a Drink?